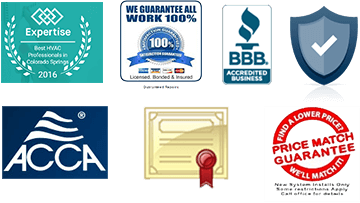 high efficiency furnace problems - Basset Heating & Air Conditioning Inc. high efficiency furnace problems - Basset Heating & Air Conditioning Inc. The DOE had previously made this proposal to increase efficiency standards to take effect back in 2007. However, this proposal was withdrawn as a result of a lawsuit filed by HVAC industry leaders citing numerous concerns on how the proposal was written and requirements within the proposal that were challenged. But a new proposal is back on the table, and likely to soon go into effect. Homeowners across the country will be affected by this new mandatory requirement. High efficiency furnaces not only cost more to install. But high efficiency furnace problems will result in more repairs and required maintenance to keep these furnaces running properly. Under the new proposal, homeowners who currently have a standard efficiency furnace will not be required to replace their furnace. That is, until their existing furnace must be replaced (due to failure that cannot be repaired). At that time the replacement furnace is required to be at least 92% efficient in order to meet the new DOE standards. And along with the higher cost to upgrade to a high efficiency furnace, comes the unwanted side effects of high efficiency furnace problems. High efficiency gas furnaces are condensing furnaces, which produce condensation moisture during the combustion process. And this is where the high efficiency furnace problems will eventually make their appearance. Over the years of servicing all types of furnaces, I have often run across high efficiency furnace problems that I never see in standard 80% efficient furnaces. And the majority of the time these problems are directly linked to the condensation moisture produced by these condensing furnaces. But there are other issues as well. Plugged condensate drains. High efficiency furnaces produce high amounts of condensation moisture in the exhaust vent, which is designed to run back into and through the furnace in order to drain out into either a floor drain or other approved draining system. The problem is that these drains, which taper down from a 2″ or 3″ PVC exhaust pipe, easily become plugged with debris, such as dirt or insects that have made their way into the main PVC exhaust vent. If the drain becomes plugged, or even partially plugged resulting in slow drainage, the furnace will stop working. If you notice water on the floor around your high efficiency furnace, or water or rust stains within the cabinet, your furnace is not draining properly. Plugged exterior vents. Depending on the installation, a high efficiency furnace will have at least one, and sometimes two, PVC pipes exiting the home. In newly built homes these vents will usually exit thru the roof. But in most existing homes where the high efficiency furnace replaced an older existing 80% efficient furnace, these pipes will usually be found existing an exterior wall of the home. One pipe is always required, which is for the exhaust. If there are two pipes, one is for the combustion air intake. If either of these pipes become obstructed, the furnace will not operate. 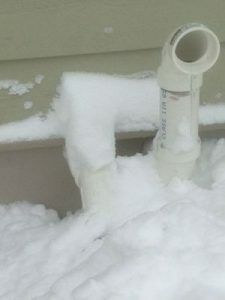 The wall exiting pipes are far more prone to blockage, usually from snow or ice buildup. The area around these pipes must be kept clear of bushes, weeds, and other objects. But insects, such as wasps or moths, or rodents such as mice or squirrels, can also enter thru these pipe openings and cause high efficiency furnace problems. Screens are available to cover these pipe openings, but in colder climates where snow falls, these screens can actually cause the problem, as the warm air exhausting from the pipe creates condensation on the screen which in turn ices over, causing the furnace to stop working. Here in Colorado, code does not allow a screen over the pipe termination due to this potential problem. And all pipes exiting the home must be located above the anticipated normal snow fall grade. But even so, they may still become plugged. Plugged heat exchanger. High efficiency furnaces, unlike standard efficiency models, have a secondary heat exchanger. This heat exchanger, similar to a car radiator in appearance, is located in the furnace before the primary (or main) heat exchanger. It is located just above the blower housing (in upflow models) or just after the blower (in horizontal models). Because the fin spacing on these secondary heat exchangers is so narrow, these heat exchangers are highly prone to becoming plugged with dirt, dust, pet hair, etc that passes thru or by the furnace’s filter and becomes lodged on these fins. The result is a very inefficient working furnace that is short cycling on high temperature limit control (due to over heating caused by restricted airflow), reduction in airflow thru the primary heat exchanger, or a furnace that will not stay on long enough to heat the home at all. And if your home also has a central air conditioning system with an indoor cooling coil mounted on the furnace, your AC system is going to have problems as well. It is imperative that you have a tight fitting, clean and good furnace filter in a high efficiency furnace to prevent the secondary heat exchanger from becoming plugged. SO WHAT CAN YOU DO TO PREVENT THESE HIGH EFFICIENCY FURNACE PROBLEMS? Well the simple answer is to not install one. But this will not be a choice in the near future. If your home currently has a 80% efficient model furnace that is 15 years old or more, you may want to consider replacing it now before the new efficiency standards go into effect. 80% efficient furnace models are available with 2-stage heating and high efficiency variable speed blowers (not to be confused with condensing high efficiency models). And Amana offers these models not only with a lifetime heat exchanger warranty, but certain models include a lifetime unit replacement warranty, meaning it’ll be the last furnace you ever need to purchase. If your home currently has a high efficiency condensing gas furnace, it is important to have it properly serviced every year. This includes inspecting and cleaning of all condensate drain pipes, tubing, traps, etc as well as ensuring a proper fitted filter. And inspecting the PVC pipe terminations and insuring there are no obstructions (particularly on side wall vented units). In the long run, I’ve found that the money you save on your heating bill with a high efficiency gas furnace will not give you a return on your investment when you consider the initial higher cost of installation of these furnaces, along with the cost of maintaining these models. Breakdowns due to plugged vents, drains and heat exchangers can not only be costly to correct, they are not covered under the manufacturer’s warranty either. The warranty provides to cover the cost of a failed part, but not for care and maintenance of the unit. Given the choice, I would much rather install a good 80% efficient model over a high efficiency model hands down. The problem is this choice will likely not be available in the near future.